Elementary school yearbook themes can be tough. Go too minimalist and you’ll lack the “fun” that everyone likes so much. Go too “fun” and your older students will accuse you of picking something too juvenile. So, what’s there to do? There are a bunch of ways to settle on that, including letting your students vote and doing something totally school-specific (like highlighting student artwork), but you can also turn to pre-designed themes to help you get the job done. 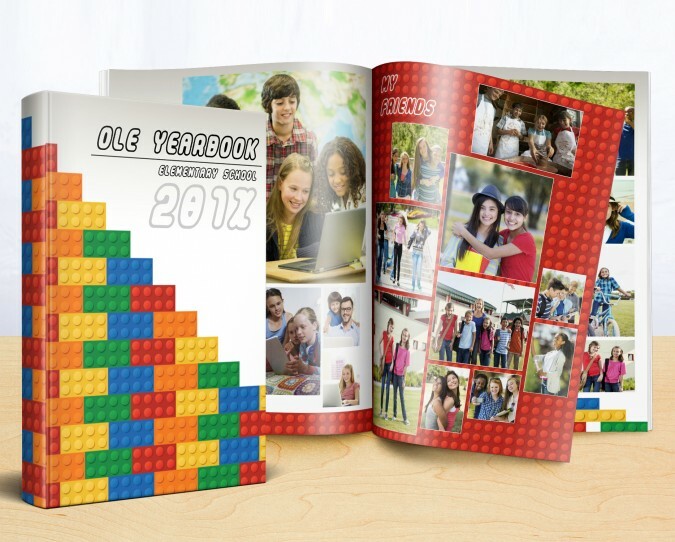 Inside this post, we’ll take a look at 15 fun-filled, artistic elementary school yearbook themes that’ll have that “just right” feeling. 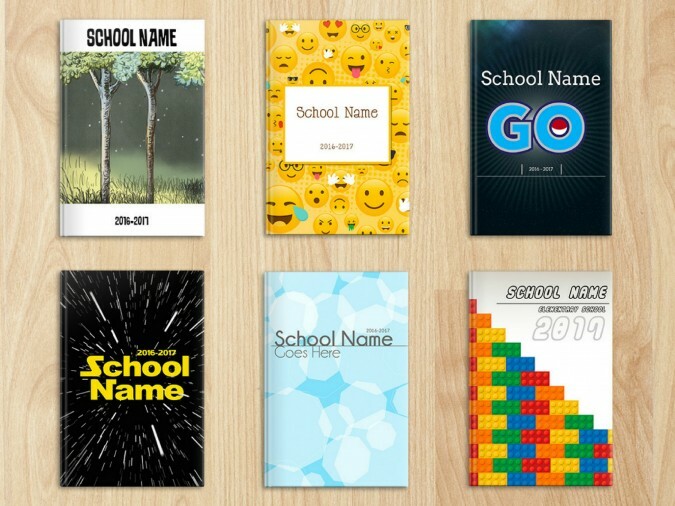 First, though, it’s important to understand a little more about why elementary yearbook themes are so unique. Because, if you can do that, it’ll be way easier to pick an elementary school yearbook theme that works for your whole school. 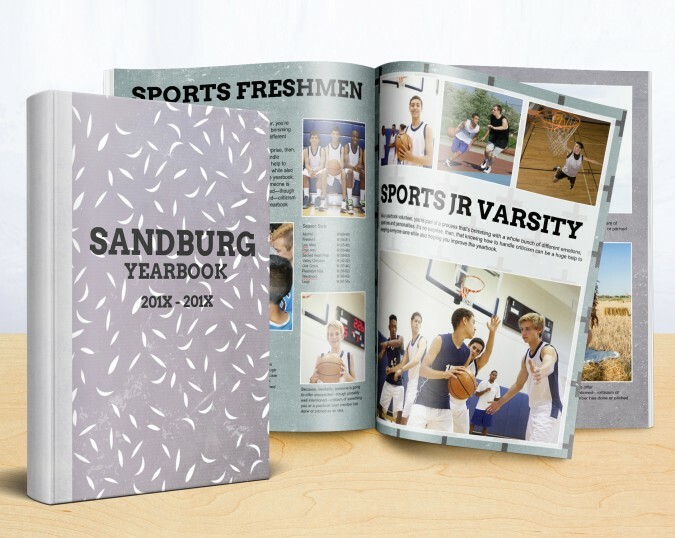 While everyone knows yearbooks are the single best way to remember a school year, it’s also important to remember the difference between an elementary school yearbook and a high school yearbook. High school yearbooks are like are one big Vitamin C song about the finality of things (but way, way better written). Elementary schools, on the other hand, are more about growth and all the fun that comes along with it. 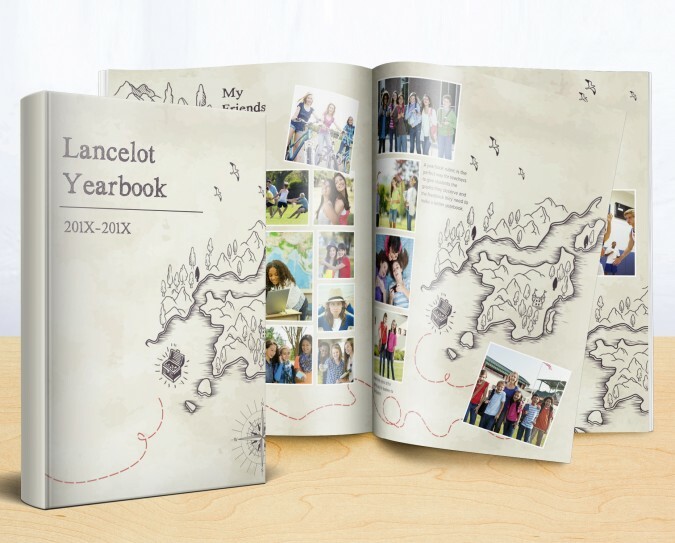 For this reason, elementary school yearbook themes don’t have to carry that same weighty nostalgia. They can be whimsical, kitschy, and colorful. 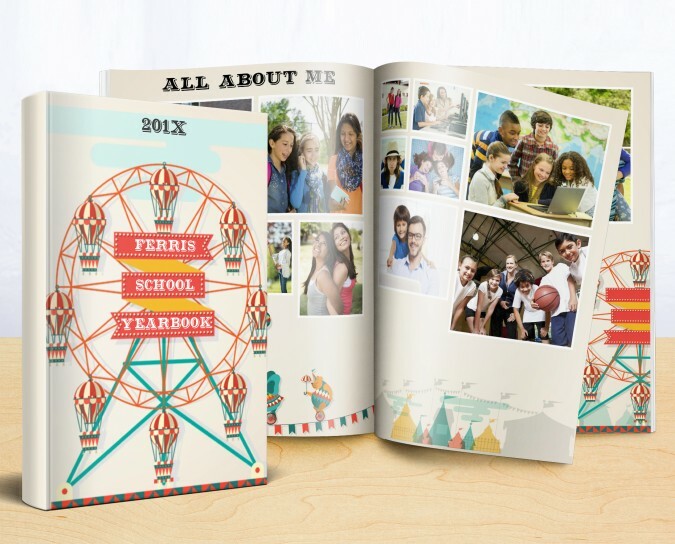 They can forfeit the usual polished look of high school yearbooks, and have some fun instead. Every student in your school is a star: make them feel like it with Charlie! 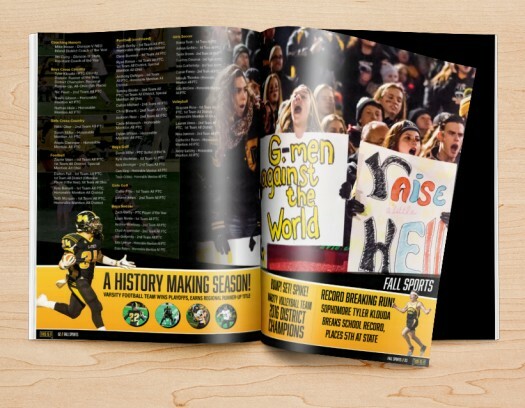 The marquise on the front sets the tone for the whole yearbook, and the eye-popping headlines that appear on every page keep the spotlight on your students from cover to cover. 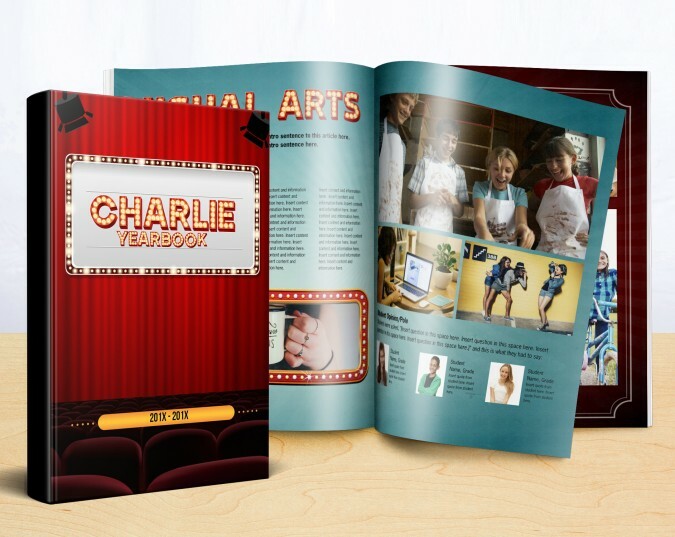 Charlie is the perfect yearbook theme for schools where the arts are a coveted component of the curriculum. Named for the father of geometry, this beautiful elementary yearbook theme uses color and shape to create a great pattern. I really love the overlay of the various opacities; it creates the illusion that there are actually more than two colors. If your book is packed with busy images and you’re looking for a theme that will compliment (and not detract from) them, use Euclid. 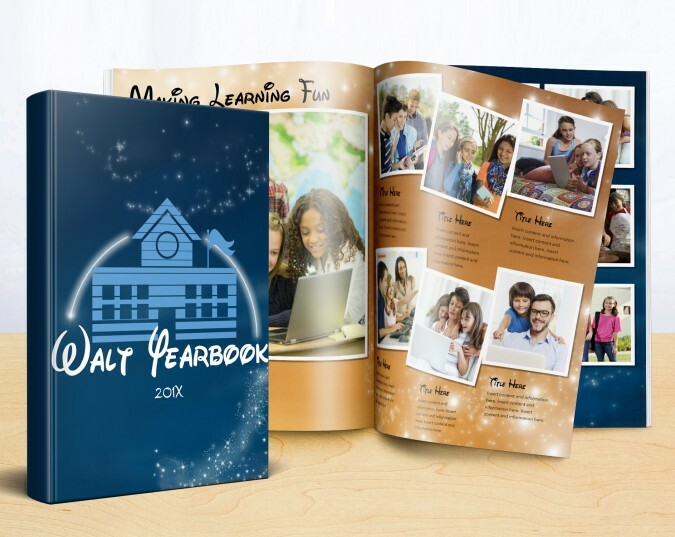 By the time students receive their yearbooks, summer is mere weeks away. For them, that means swimming, sleeping in, and, in a perfect world, amusement parks. Channel students’ enthusiasm for all things fast and/or whirling with Ferris, a theme full of amusement park imagery and complementary patterns. Georgia O’Keefe is considered the mother of American Modernism. 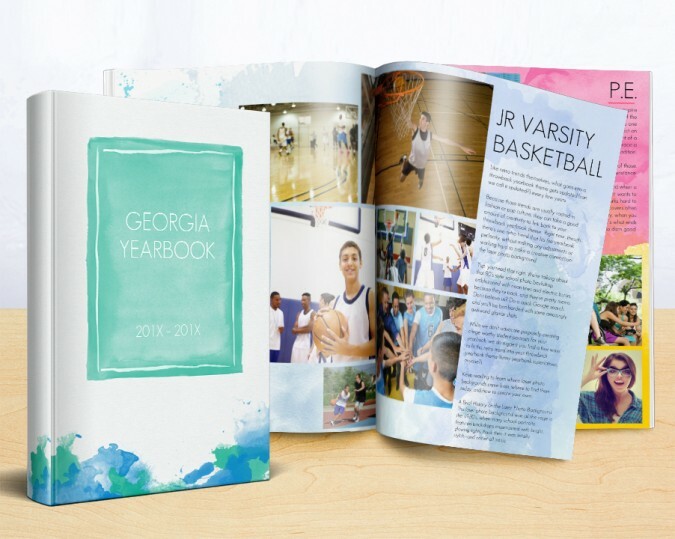 If you’re looking to bring a gorgeous watercolor pallet to your next yearbook, our Georgia theme is the one for you (check how the two spreads pictured above; the way the secondary colors in the photos are complemented by the watercolor backgrounds is awesome). Can you tell where the inspiration for Go came from? Remember that game everyone was playing last summer? The one where flocks of kids (and adults) would crows around in parks and outside of various landmarks in pursuit of creatures that only existed on their phones. 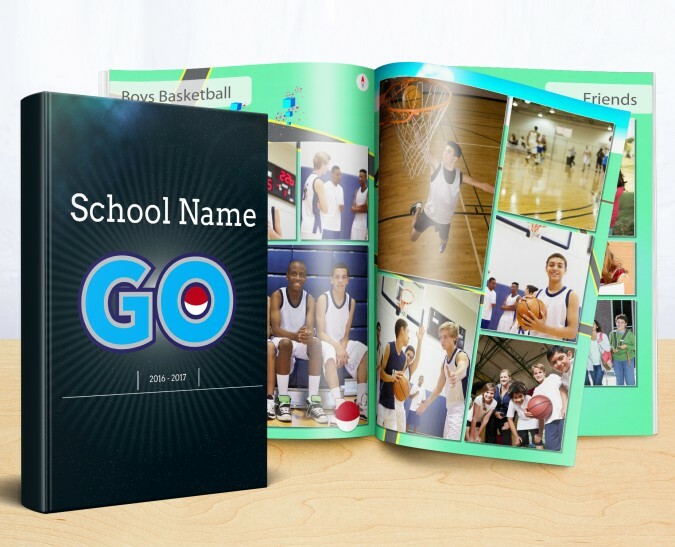 If you want your yearbook to be the very best, like no one ever was, use the Go theme! There’s old-school, then there’s the Lancelot theme. Those valorous and brave enough to chose it are guaranteed to turn out an elementary school yearbook students love. The backgrounds on the spreads aren’t overdone, but there’s enough going on to warrant further exploration of every page. Let the wild rumpus start! For photos depicting raucous school events there’s nothing better than the Max theme. 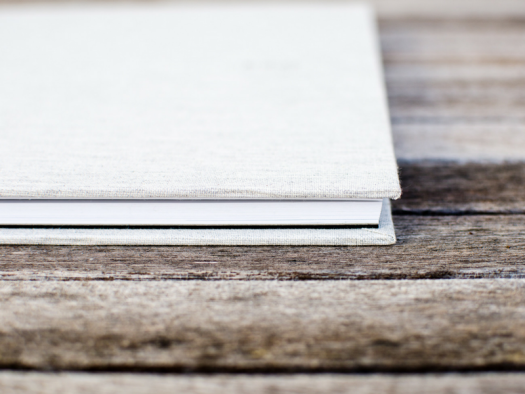 The very strong, defined aesthetic alleviates some of the creative burden that often falls on the shoulders of the advisor, freeing up time to ensure great copy and even better pictures. 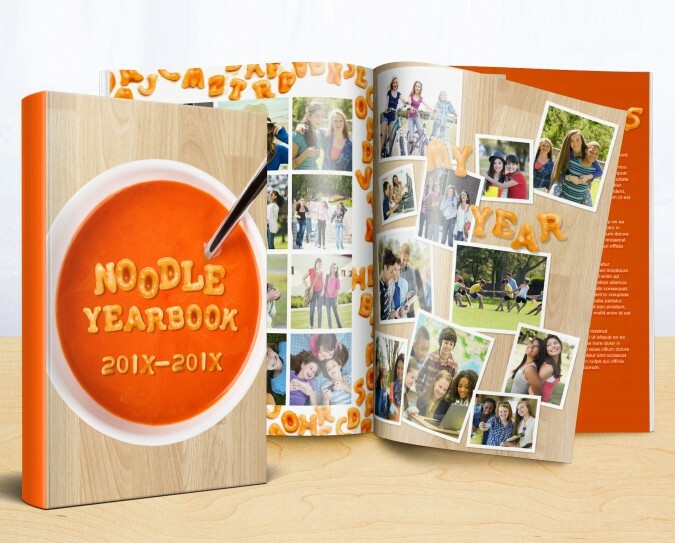 The Noodles theme combines two things elementary school students love: playing with food and looking t pictures of themselves. The bold colors provide a nice background for pictures, too. If chicken soup is good for the soul, alphabet soup has to be good for memories, right? When Ole Kirk Christiansen first started building toys in 1932, he made them out of wood. Legos might have changed since then, but they represent everything a school year should: building, learning, and creativity. 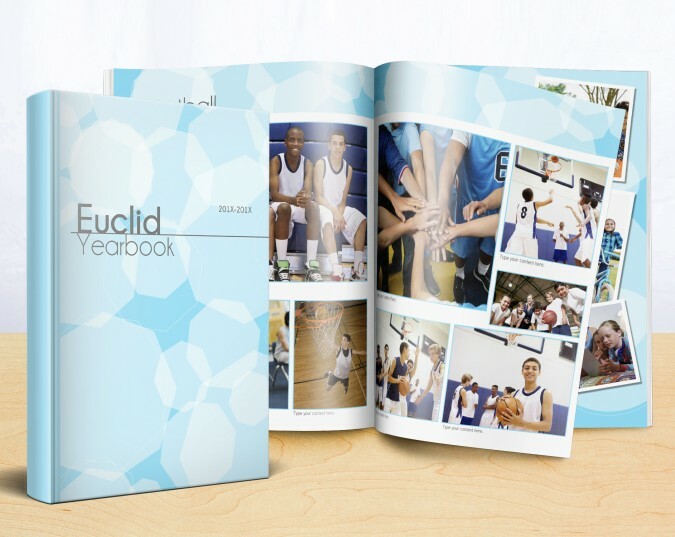 The Ole theme lets you work those guiding principles (and a little bit of fun) into your yearbook. 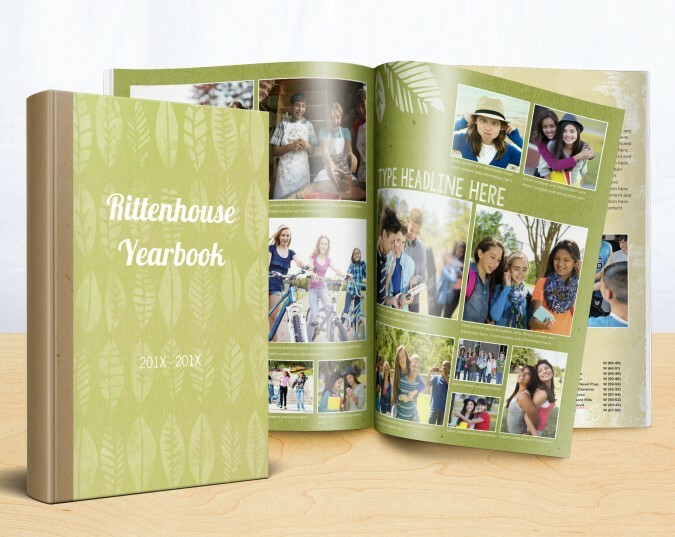 The Rittenhouse theme, which features earthtones and leaf imagery, is named after the first paper mill in North America. Built by William Rittenhouse and parked against a creek in Philadelphia, the paper made there was used for local newspapers as well as those in New York. Carl Sandburg, the Pulitzer Prize-winning poet, wrote two different poems about fog. 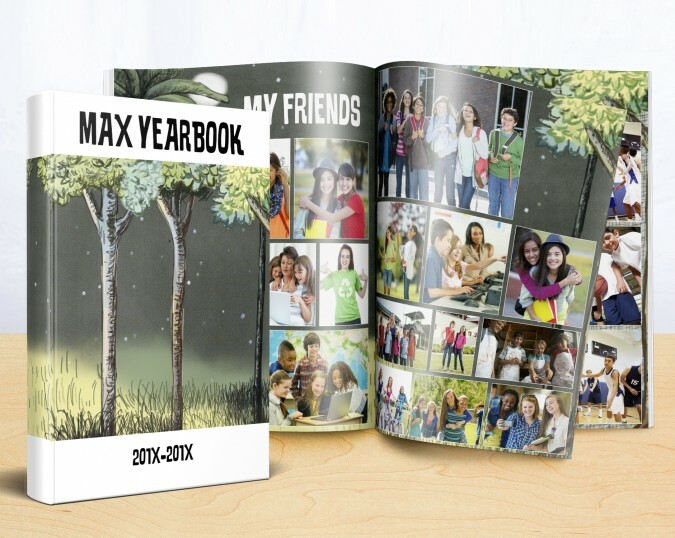 This yearbook theme has a bit of that feel to it, doesn’t it? Simple and elegant, it allows your photos and copy to take center stage. Who doesn’t love emoji? Outside of being ubiquitous in everyday human interaction (especially since more and more kids are getting phones in elementary school), they’re endlessly entertaining. 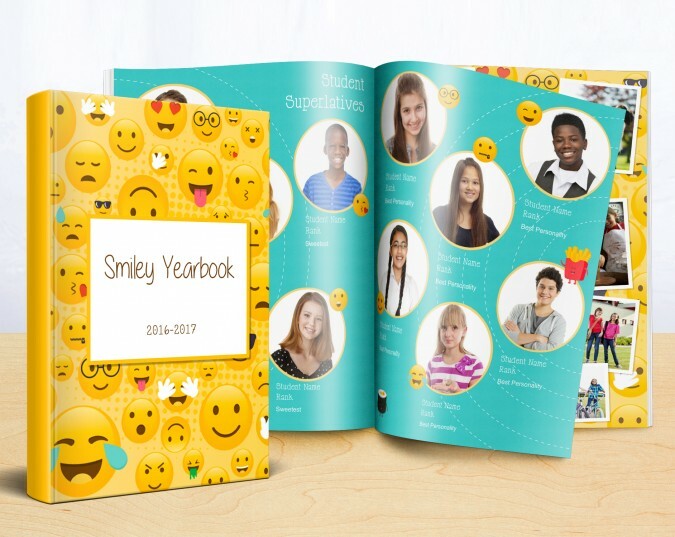 Implement them in your yearbook theme with Smiley and kids’ll come clamoring (that superlative page with corresponding emoji is fire). 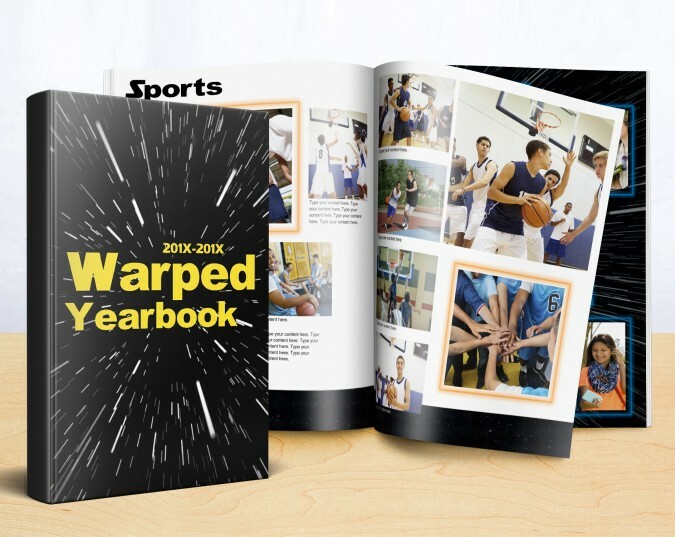 A long time ago in a galaxy far, far away… they also had yearbooks. 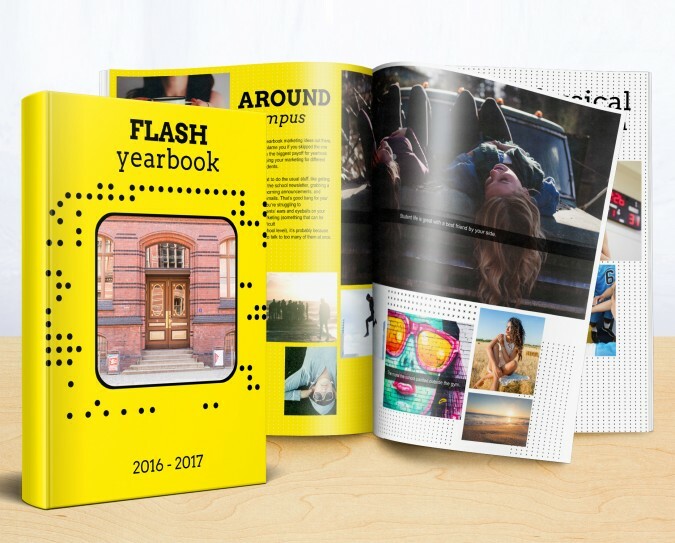 Elementary school yearbook themes don’t have to be heavy on nostalgia or on documenting all of the final steps in a chapter. 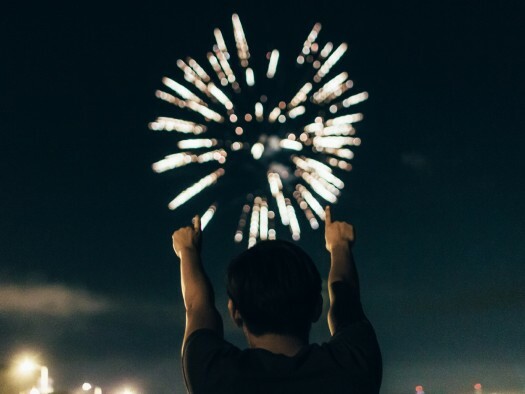 Because of that, there’s a ton of room for having some fun and celebrating the growth of your students.